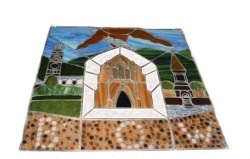 For prices of stained glass commissions please click on the main commission details page. 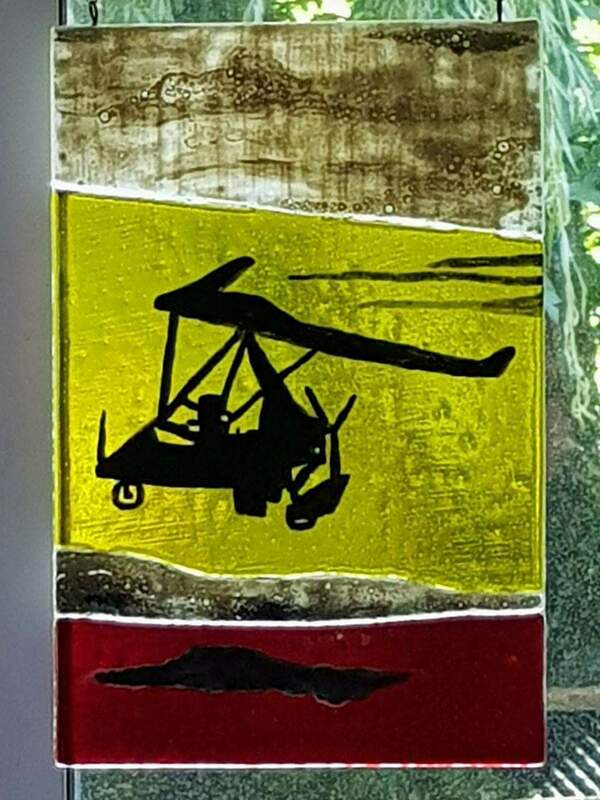 ​ Fused and stained Microlight Sun-catcher. Leaded Abstract piece that was going to be encapsulated within a double glazed window. 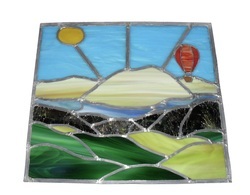 Customer Quote: ​how amazing the window looks. It's beautiful, just what I wanted and I'm so happy with it. When the sun shines through it, the colours are reflected into the room just like a rainbow. I've not had the perfect reflection yet as the colours hit the very scruffy scaffolding in the room but it gives me an idea as to what it'll look like when the room is finished. Thank you so much for doing it for me. A Copper foiled panel for an internal window that reflects the view from the front of the house. 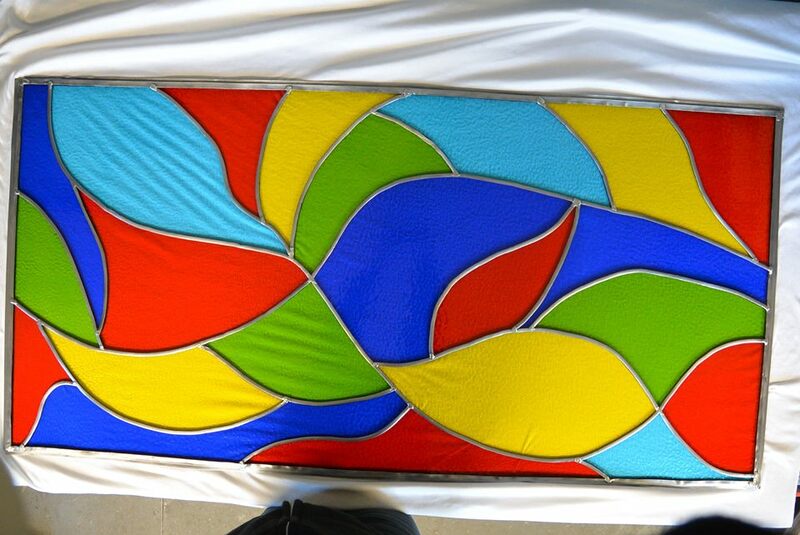 A Leaded panel, based on a customer's own design. 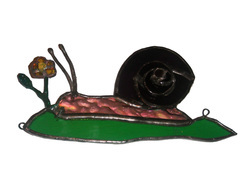 Copper foiled snail with a 3D spiral shell and a painted wire stalked buttercup. Fused suncatcher mask of a well known super hero. The eye are 2 layers of clear glass with silver mica powder between them. Leaded door panels to match existing windows. Leaded door panels, to fit in a custom made door. 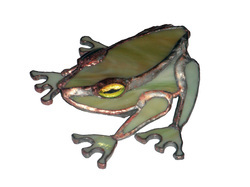 Copper foiled piece just under A4 in length, with kiln fired paints used for face detail. 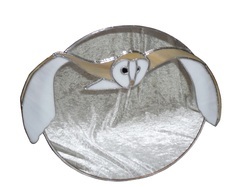 A present for an owl lover, the background is actually mirror glass. Designed to accent a blind, cushions and vase. The solder was finished in an antique copper effect. Grim reaper mirror in copper foil, edged in lead. over 110cm tall and 70cm wide (at widest point). For Mr Markley owner of Carr's Coaches and Markley Transport, which are based in Silloth Cumbria. A Leaded Light fire screen designed to be attached by hinges, to a dis-used fire place. Given as a wedding present. Note: the screen is not rectangular, as the recess its self was not rectangular. A Leaded Light window that was fitted into a 1930's kitchen door to match a bamboo kitchen. 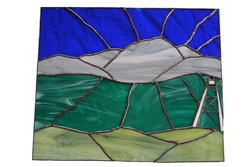 Copper foil panel set in a photo frame I have tried to capture the true beauty of Cumbria in stained glass, based on an Artists Impression of Thirlmere.